Found 39 file extension associations related to Baldur's Gate II and 5 file formats developed specifically for use with Baldur's Gate II. 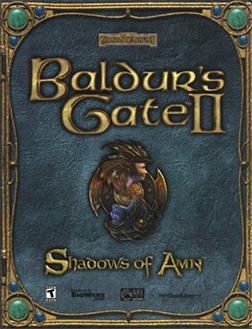 Baldur's Gate II: Shadows of Amn is fantasy role-playing game developed by BioWare. This epic sequel of original Baldur's Gate will immerse you in a world of intrigue, adventure and fierce combat where your ability to discern the difference between these sides - with the assistance of steel and spell - determines your fate. If you need more information please contact the developers of Baldur's Gate II (BioWare), or check out their product website.